Technology, quality, design and sustainability. 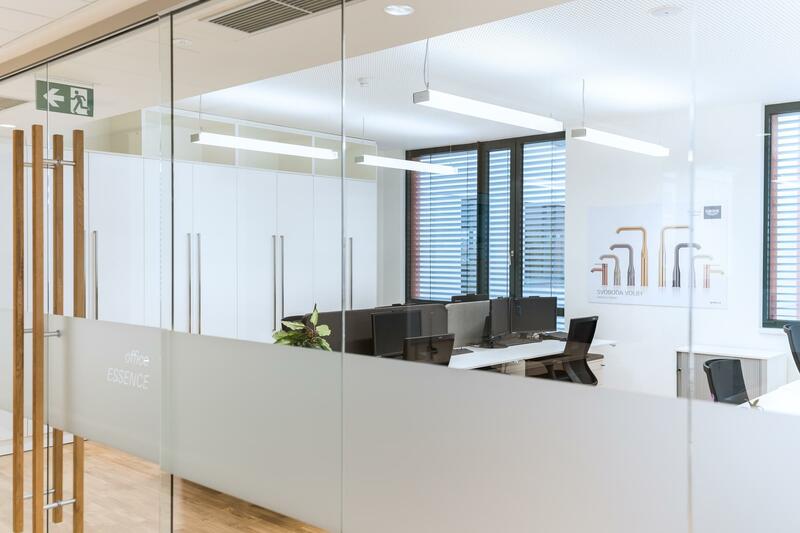 These values played an important role in the creation of new offices for GROHE, a leading world manufacturer of sanitary equipment. We worked on the project together with the Jakub Cigler architectural studio, which created a simple, airy design without superfluous embellishments. 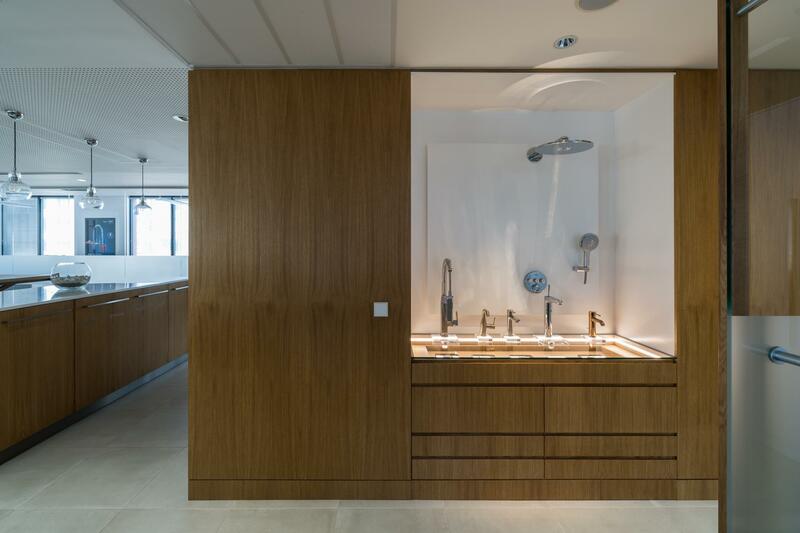 The new office space exudes the spirit of the company's motto, which promises an uncompromisingly pure water experience ("Pure Freude an Wasser"). Wood combined with neutral colours (white, grey and black) gives a luxurious impression and the mark of quality. Upon leaving the elevator, visitors are welcomed by the company's main logo with the above-mentioned motto. 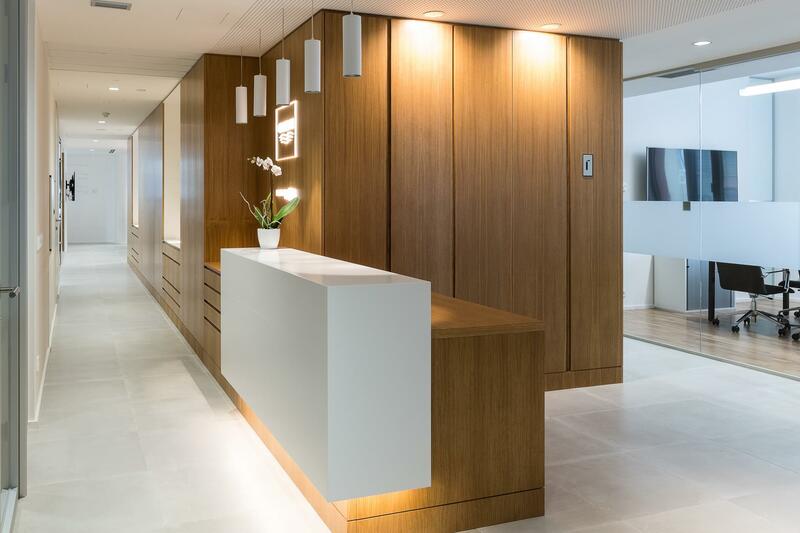 A glass entrance door reveals the lobby and the wood reception desk. Part of the reception desk is raised and finished in white lacquer, behind which there is an area that serves as storage space. The room is complemented by a vibrant neon logo of the company and suspended luminaires in the shape of cylindrical tubes. 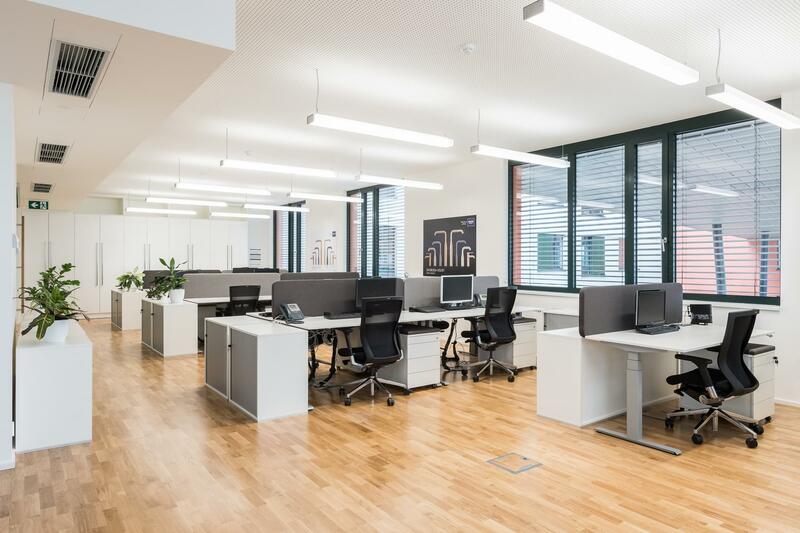 We selected CAPEXUS to refurbish our new offices in a thorough selection procedure. As the person in charge of this project, I can confirm that our choice was correct and that we are very pleased in every regard, from budgeting, communication and deadlines, to the way in which the company handled changes from our side and dealt with the lengthy approval process. CAPEXUS responded very well to modifications or problems, and in spite of every challenge managed to meet the deadline. After project delivery, all defects and faults were resolved and everything was accomplished as agreed. 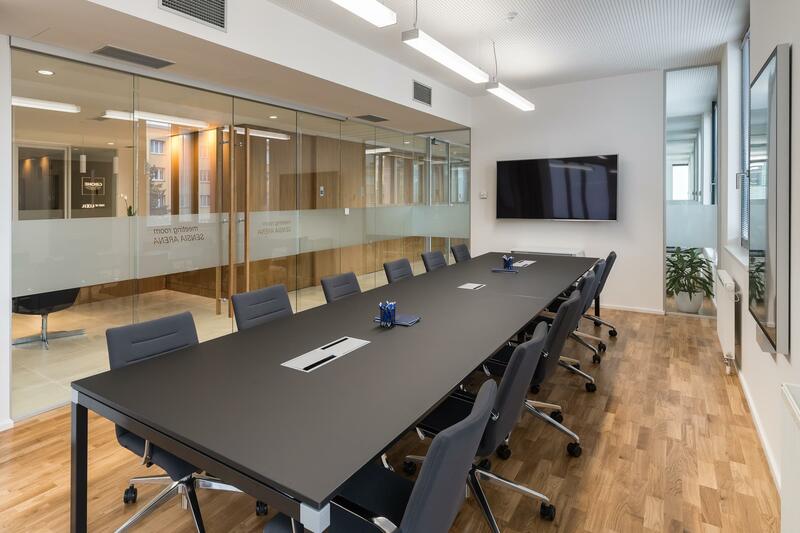 The level of communication was first rate and our concept for a new office was fulfilled to our full satisfaction. 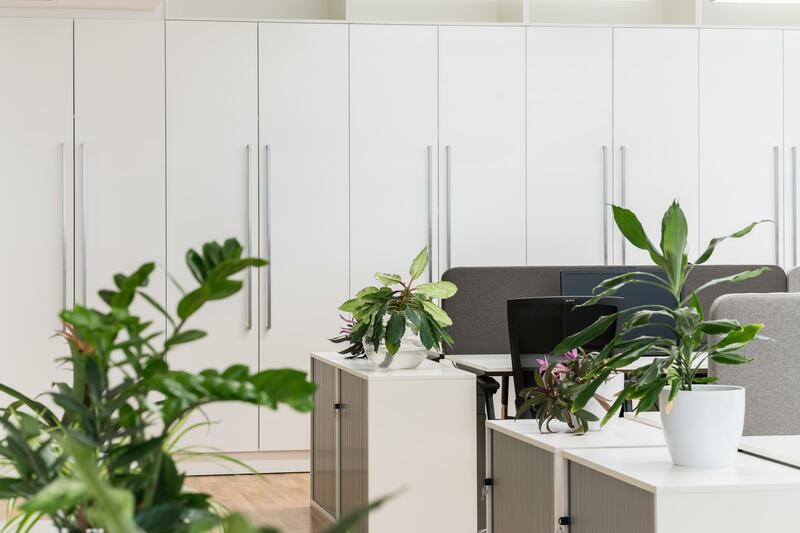 We recommend this fit-out company in the highest terms. 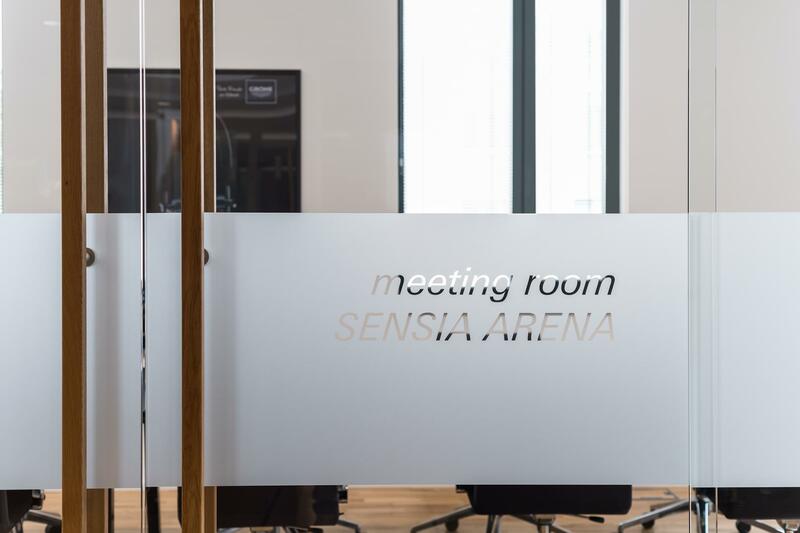 For ease of orientation, the meeting rooms are marked with stickers on glass rails. 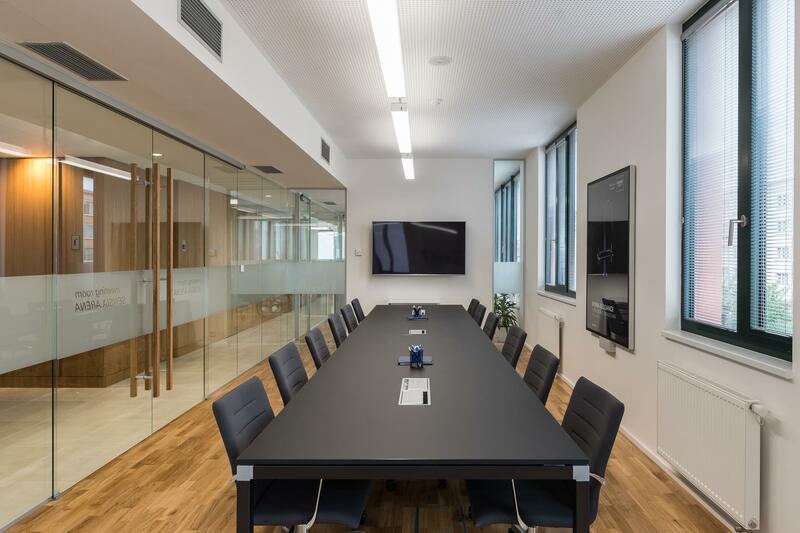 The meeting rooms feature white sliding screens, making it easy to reconfigure and connect them as needed. 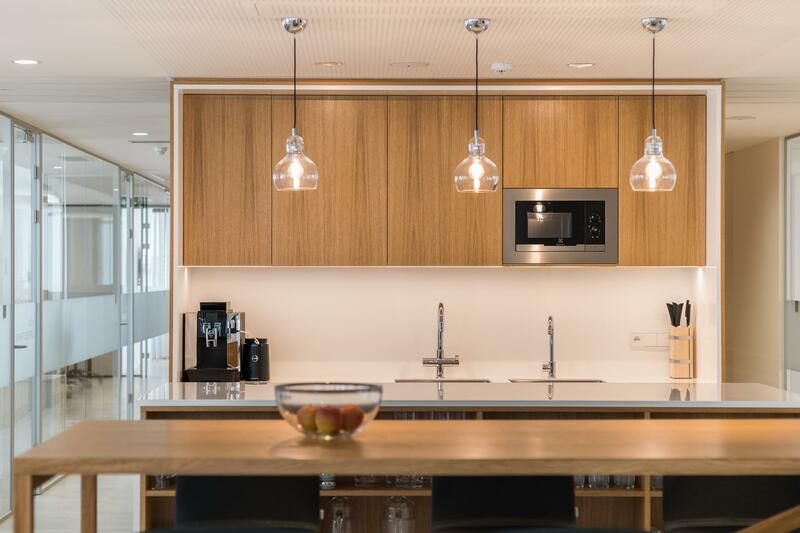 Some rooms contain thematic stickers on the walls related to the company's identity..
Wood as well as black and white elements and design lights are also the dominant features of the interesting and luxurious kitchen. 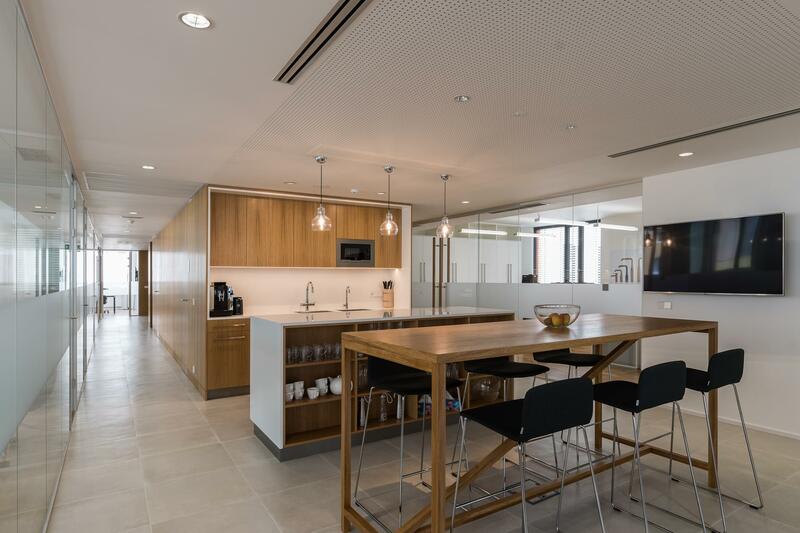 The kitchen area is extended by an island that employees can use to prepare snacks or as an extra place for lunch. built-in wardrobes in the rear part of the open space. 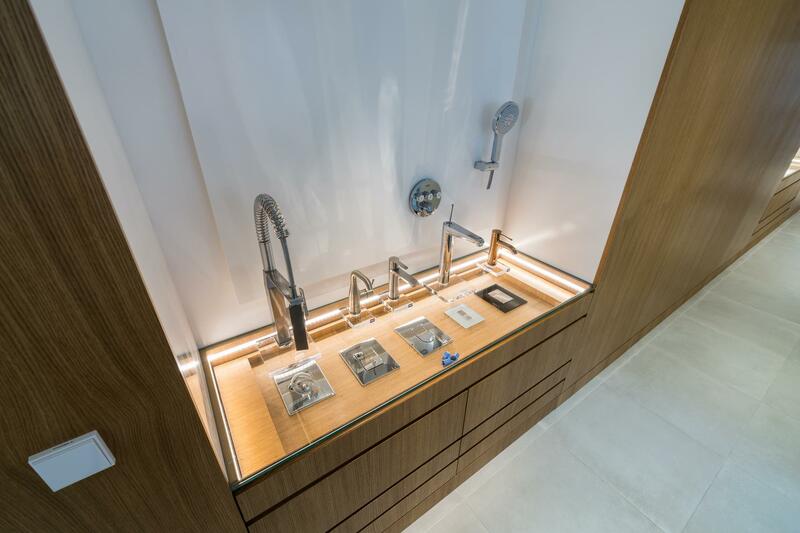 In the product shelves, which are embedded in a wooden built-in wardrobe, one can find not only the company's products such as faucets and showerheads, but also its current catalogues and samples stored in drawers just beneath them. 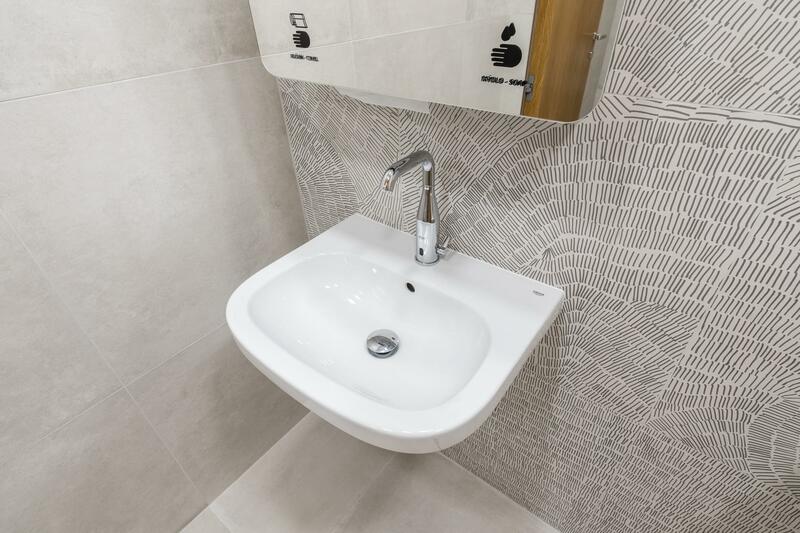 The bathroom and toilets are equipped with the company's own products and gadgets, so visitors can hardly be left in doubt about what the company does. 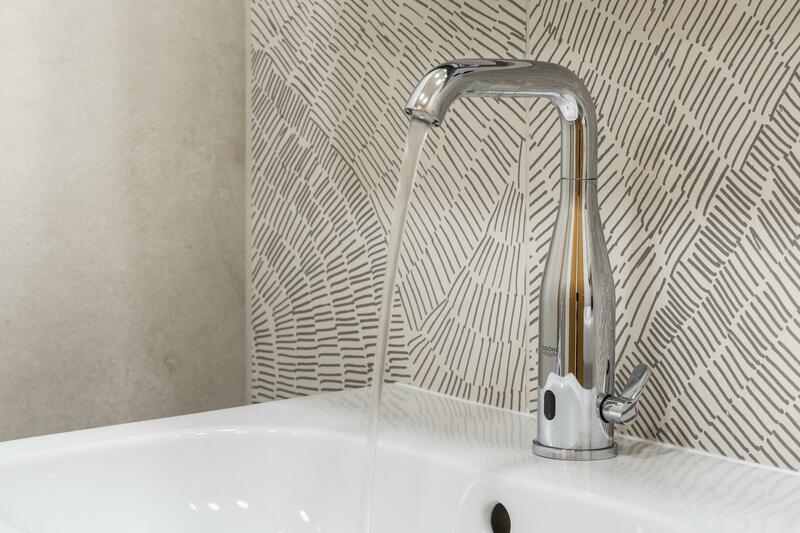 Sustainability as one of the company's core values is reflected in waste recycling and devices to ensure lower and more economical water consumption.